In this lifetime, we are gifted one life to journey, and our desire is to live most joyfully, passionately, and genuinely as who we are and who we want-or are meant-to be. The unique Soul to Soul Connection and Communication experience presents a positive, completely new, refreshing, kind, in-depth, mindful, universal, and compelling personal and intercultural communication paradigm as we move forward in the twenty-first century. Communication expert Ruth Lindeck Forman takes the reader through several enlightening, intimate, and, for the most part, light-hearted conversations. She includes myriad anecdotes to enhance, inspire, uplift, and promote well-being, civility, and inclusion. The reader-friendly information is supported by science and woven with connections to nature, current events, and socio-political issues such as racism and diversity. These ideas are treasures which encourage greater compassion and understanding, not only for the reader, but for others as well. Ruth reminds us that at each moment, we choose to respond positively or negatively and sensitively or insensitively. Likewise, we choose to honor or dishonor ourselves and others. These are our choices, and they are a formative facet of our character and aura. The journey leads the reader through three sections. 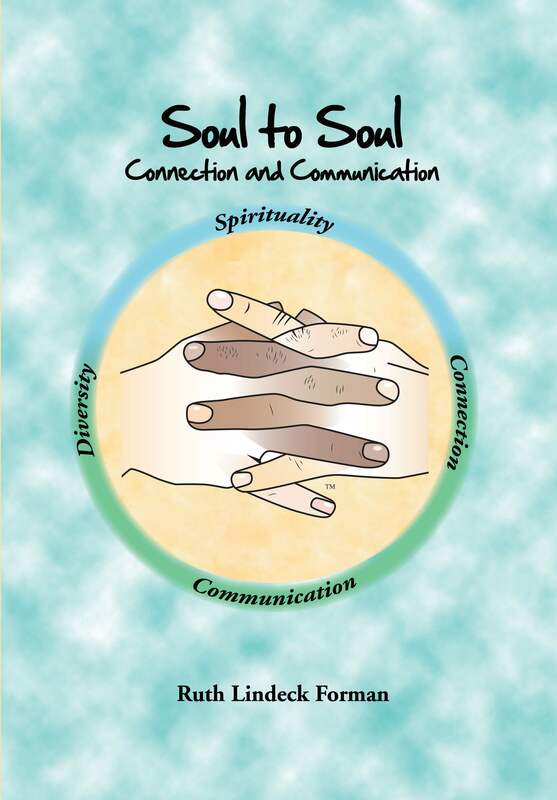 First, Soul to Soul Connection introduces source-connection, the essence of each person, and discusses how to connect to that soul-connection within all others. Ruth declares that each person has the sole right to define who she or he is. She suggests that it is best if that definition is first guided by what is in the person's heart and soul as a member of the human race. She also encourages each person to live their dream. Second, Soul to Soul Communication focuses on personal and interpersonal positive, effective, and appropriate communication and presents seven major chapters that include more than forty topics. When these are combined, integrated, and applied, they provide a thoughtful and comprehensive understanding and command of communication. Lastly, Soul to Soul Intercultural Communication is devoted to embracing diversity and offers the necessary nuances, tools, and wisdom to create comfort and trust with people of different groups or backgrounds. The reader gains a lifetime understanding of the hand-dome and why each person feels, thinks, acts, speaks, and writes as she or he does at any given moment. A significant chapter is devoted to numerous negative lenses that block our ultimate well-being and that of others. Once you have discovered and noted those negative thoughts within yourself, you engage the time-tested Identify, Block, Move, Delete, and Replace technique to significantly reduce or erase these harmful thoughts and replace them with positive, inclusive, and uplifting views. The book also offers a private and nonjudgmental guide, the Forman Approach to Identify Prejudice Within Ourselves, to help you become aware of what you truly feel. After all, you have to be aware to care, and if you care you are aware. Finally, Time to Reflect offers questions for each chapter that allow you to pause and think through what you absorbed. Then, you personalize your responses so that they accurately reflect the meaning and intention of your message. These pauses further enhance your and others' well-being. This promotes your own mindful and source-connected, positive communication environment, and a trusting and inviting aura that welcomes others. Ruth shares her life's journey of more than seventy-five years, as well has a half century of experience in the field of speech and language pathology. Initially, she served patients in stroke rehabilitation. Later, as a Specialist in Personal and Intercultural Communication, she consulted with and lectured to a varied population of differing cultural backgrounds. She also recounts her most unusual adventuresome travels with her husband to more than thirty-five countries, and her experiences living in a local village on a tiny, exotic, remote island, Nevis, in the West Indies, while overcoming medical challenges. Each section of the book is filled with practical and powerful insights and tools as well as charming and thought-provoking stories of people from numerous cultures and all walks of life that highlight how they triumphed over or serenely accepted their challenges. These pages promote our ultimate best to benefit ourselves and others. As situations and events unfold, Soul to Soul Connection and Communication provides a pause to reflect and serves as a valuable lifelong guide.